Lodz University of Technology is on the way to develop a research and study program in the field of Human-Computer Interaction (HCI). Therefore, we are proud to announce the HCI related contest for the best student research project. Selected projects will be conducted with mentors in spring semester 2019. Authors of the best projects will get opportunity for a research visit to Harvard University. We will accept one page proposals unitl the end of January, 2019. Details will be given in January. The contest is organized by the Ubicomp research initiative of the Institute of Applied Computer Science together with International Faculty of Engineering. The international summer school on Internet of Things: "Connect’em All'2018” were conducted by the Institute of Applied Computer Science in Lodz University of Technology, Lodz, Poland, within 7-13 July 2018. We had 20+ students from all over the Europe (Czech Republik, Denmark, Greece, Germany, Macedonia, Portugal, Spain, Slovenia, Turkey and Ukraine). The summer school was organized thanks to cooperation with BEST association and Ubicom Student Engineering Club. Classes were held in Centre for Information Technology and the Institute of Applied Computer Science. Our students won 3 best student scholarships! Jakub Forysiak, Krzysztof Fudała i Piotr Krawiranda received awards and cash prizes from the Deputy Prime Minister J. Gowin. Now they are working on augmented and mixed reality applications under the supervision of Andrzej Romanowski. Congratulations! Today we have kicked-off the project looking at how can we advance computationally research on microRNA normalization towards defining proper biomarkers in cancer radiotherapy. The data science team is growing. Welcome to the new research students onboard! UX design workshops for begginers by Ubicomp Engineering Club. Data analysis group research seminar was held on 19 December of 2017. Two presentations were given by Przemysław Kucharski and Szymon Grabia. Our group collaborates actively with the Department of Biostatistics and Translational Medicine Medical University of Lodz. We invite all the interested students to contact either group leader Dr. Andrzej Romanowski or PhD student, Przemysław Kucharski, MSc who is a direct contact person between our teams. 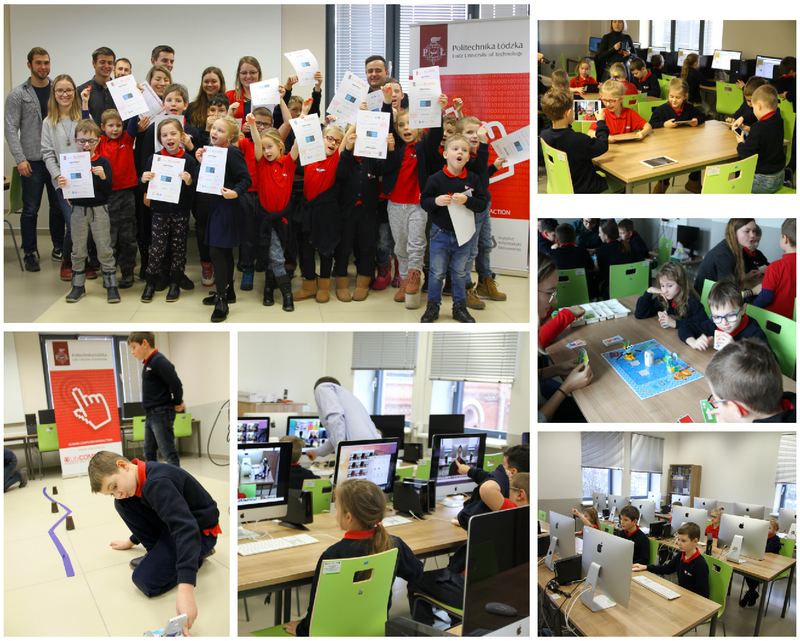 Hour of Code 2017 conducted by Ubicomp Student Engineering Club. Ubicomp Students' Engineering Club officially started its activity! The club is associated with the Institute of Applied Computer Science, Lodz University of Technology. There were ca. 25 students (different age, various background & fields of study) at the first grand meeting on November 2, 2017. We discussed how we understand HCI and ideas for possible projects development and research. Natalia Paluch is the President of the board, with Bartosz Ammer, Klaudia Greif, Patryk Pomykalski and Mikołaj Woźniak as the Deputies. The main advisors of the club are Dr. Krzysztof Grudzien and Przemyslaw Kucharski, MSc. Congratulations to all the members and good luck with your projects in HCI! Ricardo Queiros form Polytechnic Porto presents aspects of gamification in programing learning within MOOCs (massive open online courses). Team of our students: Krzysztof Fudała, Jakub Forysiak i Piotr Krawiranda has won the 2017 edition of ABB IT Challenge! Congratulations to the HomU team and the MAIN computer science student circle lead by Dr Tomasz Jaworski. We conduct research on using drones for support runners during races. More info about research on Ubicomp can be found in here. Process tomography session again in Łódź. Professor Jan Sikora (Lublin University of Technology) and Dr Tomasz Rymarczyk (Netrix co.) visited Institite of Applied Computer Science on May 15, 2017. Professor Jennifer Widom at the Institute of Applied Computer Science, Lodz University of Technology, Poland. Enjoy 3-day workshops of "Big data" and "Design thinking & collaborative problem-solving", which will be conducted by Professor Jennifer Widom from Stanford University. Team our students (Computer Science and IT from the EEIA Faculty) won the Cisco Swith Up Challenge 2016 in Krakow! Team members are participants of an Erasmus Mundus LAMENITEC programme - Federico Navarrete, Alfredo Celso, Enrique Hernández from Central America. Students were inspired by the Pervasive Computing course conducted by Dr Andrzej Romanowski from the Institute of Applied Computer Science and they submitted the "FireFly T-shirt" project. They developed "a smart cloth which allows people to wear it during day and night and feel comfortable on the bike" that actually improves visibility of a rider, visualize the manouvers and hence improves overall riding safety. You can watch a movie of a prototype tests conducted in Lodz in YouTube service. This project and others including wearable computing, natural interfaces, ubicomp, mobile-mixed reality etc.m that are developed during the course of Pervasive Computing classes can be seen each year during the international iNOTICE conference in June. This year conference is held in Słok near Bełchatów on 22 June 2016. You are invited! Seminar on measurement techniques and computing methods for process tomography is held in Lodz University of Technology in Poland on December 10-11 2015. Seminar takes place in the Institute of Applied Computer Science. Researchers from universities and companies from Warsaw and Lublin discuss future development and collaboration. Hour of code is back again for 2015 Computer Science Education Week in December 7-13 / 2015 . This webpage is available mainly in Polish. For details, please check the code.org website. 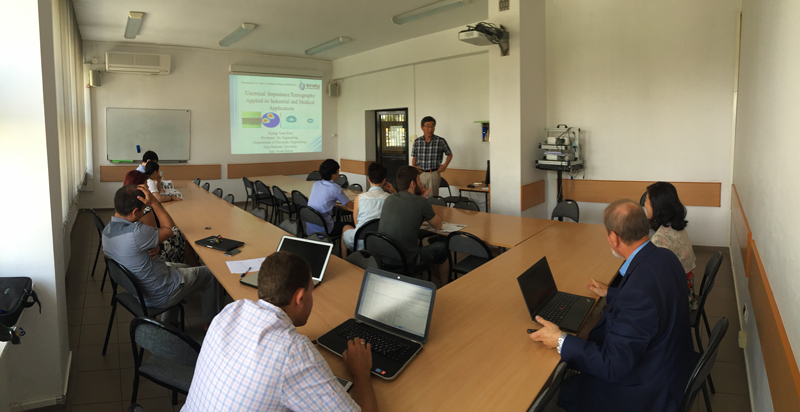 Today, August 10, 2015 prof Kyunkg Youn KIM gave a talk on Electrical Impedance Tomography Applied to Industrial and Medical Applications. Prof Kim is a head of Department of Electronic Engineering at Jeju National University Korea located in Jeju Island, South Korea. This message is available in Polish. Anyway, you should check the Hour of Code initiative. You are invited to take part! How Oscar Wilde, Dorian Grey and Rotting Tomato can help with reducing ambient noise? Recruitment for Erasmus Intensive Project DESTINE - Design Thinking in Engineering is now open. DESTINE is your chance for extraordinary experience and realization of a project with use of Design Thinking in an international, multicultural team. DESTINE will expand your creativity, trigger and release the potential for innovation that you have inside. Project will take place in June, 6-19, 2014. There are 5 ECTS credits to be accomplished. Application deadline is extended untill 9. March – apply now! Visit DESTINE website for more information. Our student got into the prestigeous IT Accelerator and for half of year will be learning from the best IT branch mentors and competing against best 72 other succesful yound innovators for the 25kEuro startup money. Paweł Błażejewski defeated more than 600 other teams and individuals from 52 countries with his passion, background and creative business idea. More info at the ﻿www.TechPeaks.eu website. The Dean of WEEIA Faculty, IT Circle, PTI and Lodz ACM Chapterinvite you to an Open Seminar , which will be held on Tuesday, 18.12.2012, 16.15 hours, room E2 building WEEIA, ul. Stefanowskiego 18/22. By order of the Rector of the Lodz University of Technology dated 31. May 2012 the Department of Computer Engineering has been transformed into the Institute of Applied Computer Science. Advanced electronics. A novel vision system. Project budget: 5.5 million PLN. We invite you to read the report of the fifteenth anniversary Jubilee of Computer Engineering Department. We have won one gold and two silver medals in the second World Cup of Computer Implemented Inventions in Taiwan (24-27 August 2011). Computer Engineering Department have offered you the possibility to participate on post – graduate studies for graduates of higher education schools. Surely you will find something what will suit you best – check it! Attractive training courses of computer science for everyone! We are organising attractive training courses from different areas of computer science. We will fit to your most convenient time, you can study in weekdays or weekends – visit us!